This mountain opening ceremony draws a large crowd to a mountaintop. Photo Courtesy of Trail Field. Japan’s native religion, Shinto, is polytheistic. That is, it believes that there are many gods and goddesses. These gods and goddesses are believed to reside in a number of places, including tall mountains. In the past, people worshiped tall mountains and were not allowed to climb them out of fear and respect for their supernatural inhabitants. However, people were allowed to walk in the mountains at particular time during the year a period known as yamabiraki, or mountain opening. 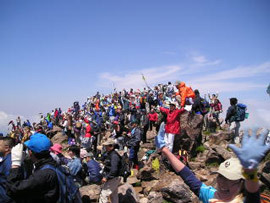 Today, however, mountain opening generally means the beginning of the mountain climbing period in summer. From June to July people gather together at the base of mountains for mountain-opening ceremonies. They celebrate the opening of the climbing season and pray to mountain gods and goddesses for safe climbing. The yamabiraki for Japan’s tallest mountain, Fuji-san, as Mount Fuji is sometimes called, is usually held on July 1. People also celebrate the opening of swimming season at beaches all over Japan in July. This is called beach-opening or umibiraki. However, umibiraki is not necessarily based on Shinto worship of the beach or ocean. Like yamabiraki, people celebrate the opening of the swimming season and wish for the safety of visitors at their beaches. Both yamabiraki and umibiraki signal the unofficial start of summer.